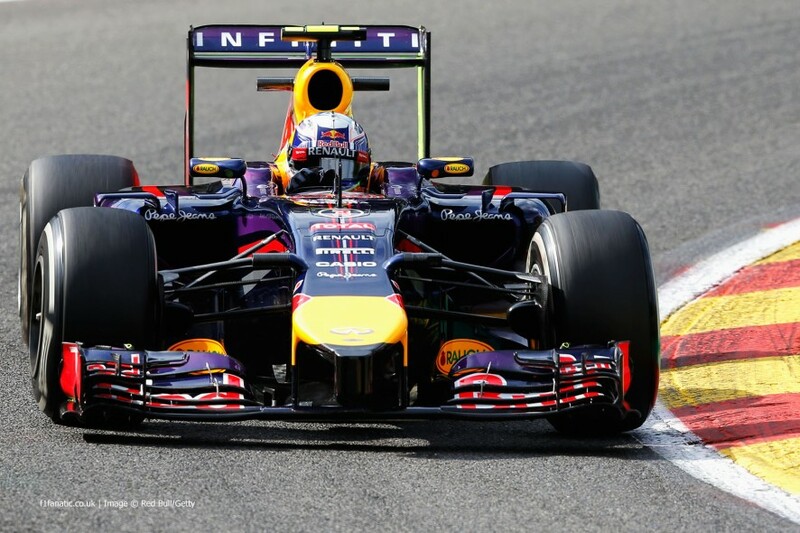 Home » Formula One: Ricciardo takes Belgian win as Mercedes feud ignites! 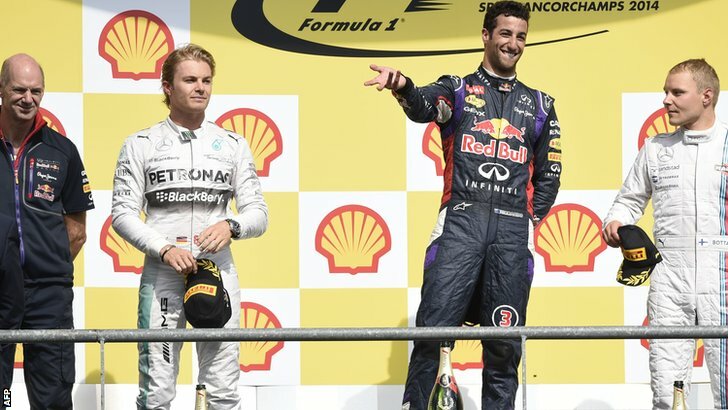 Daniel Ricciardo has claimed his 2nd consecutive win in this year’s Formula One World Championship at the Belgian Grand Prix today after starting from 5th on the grid. The Australian has now won 3 races this season after managing to hold off a late charge by the Mercedes of Nico Rosberg in the closing laps. The race saw the intense rivalry between Mercedes drivers Rosberg and Hamilton reach new levels after Hamilton suffered a puncture due to contact with his team-mate. Lewis retired the car at the end of the race after being unable to fight for points. The drama began before the formation lap was even under-way! Ferrari were still working on Fernando Alonso‘s car after the allowed time. Alonso was given a 5 second stop/go penalty later on in the race for the incident. Rosberg had a poor start from pole position when the lights went out and ended up losing out to both Hamilton and Vettel into the La Source hairpin. Vettel tried to replicate his start from last year’s race by slipstreaming all the way down the Kemmel straight. He drew alongside Hamilton into Les Combes and tried to brave a move around the outside. The move wasn’t there for him however as the German had to bail out across the run off area. He rejoined just behind Nico Rosberg. Nico Rosberg was keen to get back on terms with Hamilton after losing out at the start. The German was right on the gearbox of his championship rival as the pair came down the Kemmel straight on lap 2. Rosberg tried to succeed where Vettel had failed by trying a move around the outside at Les Combes, but once again the move wasn’t going to work. 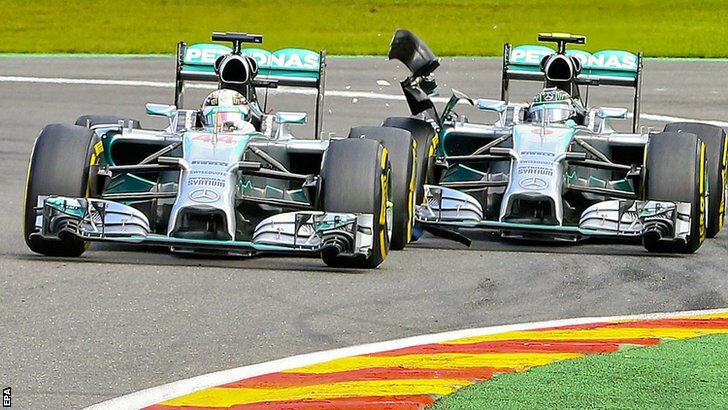 The pair made slight contact; Rosberg’s front wing slicing the left-rear tyre of Hamilton. Lewis now began to fall through the field with his punctured tyre, with Rosberg beginning to lose pace with a damaged front wing. Hamilton had to drive all the way back to the pits and as a result gained damage to the floor of his car. When he re-emerged after his pit-stop he was far down the field in 19th. Meanwhile, Daniel Ricciardo was making gains after passing Alonso on lap 4 and was catching up to team-mate Vettel in 2nd. He set the fastest lap of the race in pursuit of Sebastian before the reigning champion had a moment at Pouhon which allowed the Australian to pass. 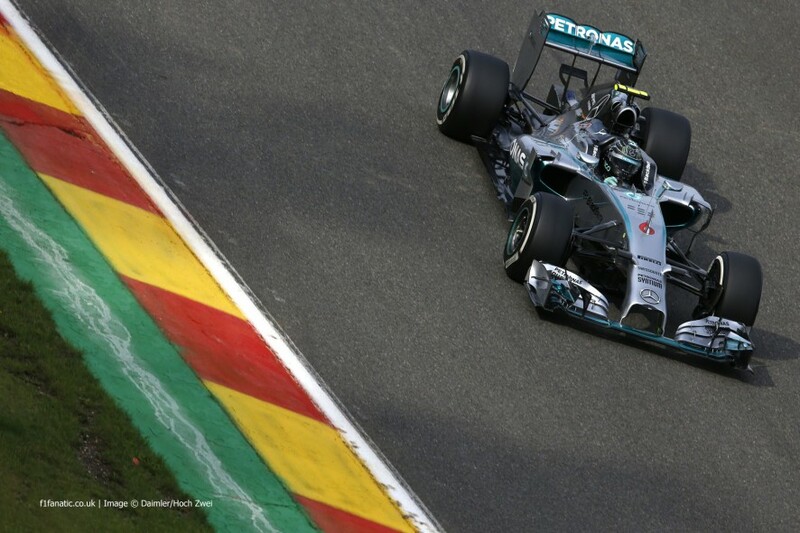 He soon started to catch race leader Rosberg, who chose to pit early on lap 8 for a new front wing. The frustration continued for Nico 2 laps later when a piece of shredded tyre debris attached itself to one of the aerials on the front of his car. The debris was fluttering in the German’s face and would not budge for a few laps. Meanwhile, the first pit-stop phase was beginning. Sebastian Vettel was one of the first front runners to pit and did so a lap before race leader Ricciardo. Despite this, Daniel would pit and re-join ahead of Vettel and crucially Rosberg, meaning that the race lead was now his. Fernando Alonso also pitted and took his penalty. He emerged in 8th. Nico Rosberg, now without debris in his face, was beginning to drag himself back to the front after his front wing change. He got himself onto the back of Vettel at the final chicane but locked up massively. This left him open to attack from Valtteri Bottas who promptly blasted past in the DRS zone. Rosberg then had to pit for a second time on lap 20 to resolve vibrations on the car. It wasn’t until lap 25 that the second phase of stops would take place for the rest of the field. By this time Rosberg had been stuck in traffic with drivers who hadn’t pit like Jenson Button. Nico managed to get past the McLaren, but did so while off the track, meaning that he had to give back the position and lose time. Lewis Hamilton was still suffering with damage to his Mercedes. He was down in 17th place and not making any progress. He began to ask the team whether it was a good idea to retire the car to save the engine for future races, but was told to keep at it due to the possibility of a safety car. Daniel Ricciardo pitted on lap 28 and rejoined in 2nd behind Valtteri Bottas before the Finn pitted himself. Bottas, now on fresher tyres, soon became one of the fastest cars on track. By the next lap he had caught 5th placed Vettel and pulled off the pass that Vettel and Rosberg had failed to complete on Hamilton at the start of the race. The Williams danced around the outside of the Red Bull at Les Combes. Vettel was soon asked whether the tyres would make it to the end on lap 44, to which he replied that he was uncertain. Rosberg decided to take a gamble with 10 laps to go by pitting for the faster soft tyre to try and give it all he had to take the victory. He rejoined in 4th and almost immediately breezed past Bottas in 3rd. Kimi Raikkonen was next on the road after somehow managing to work his magic on the Spa circuit early on. There was nothing he could do when Nico Rosberg came knocking however, as the German simply breezed past him. He would then lose his chance at a podium to fellow Finn Bottas, but it was by far an excellent day for Raikkonen. The final few laps saw the tension reach a crescendo as Rosberg tried to use his far superior grip to catch Ricciardo. He was up to 2 seconds a lap faster than the Red Bull, but it was no use. Unbelievably the man who always seems to be in the place to pick up the pieces was Daniel Ricciardo, who took his 3rd win of the season, 2nd in sucession and Red Bull’s 50th Grand Prix win. Nico Rosberg had to settle for second place and will be disappointed after losing out due to the contact with Hamilton on lap 2. 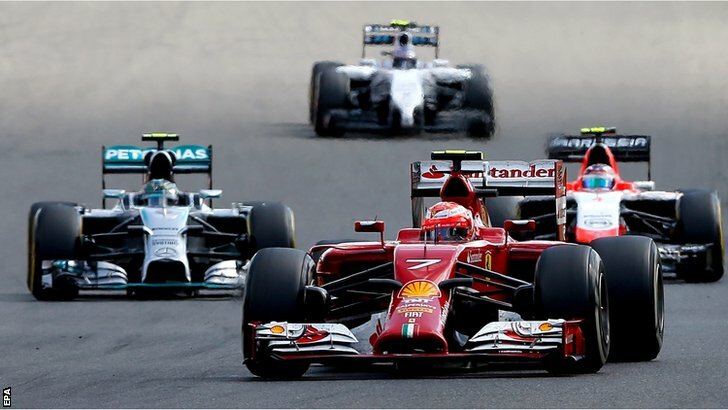 Valtteri Bottas took 3rd after his late battle with Raikkonen, who took his best finish of the year for Ferrari. The final 10 laps had seen a massive battle for 5th place between Magnussen, Alonso, Button and Vettel. Kevin had been defending strongly for the entire race, much to the disapproval of Fernando Alonso who felt that he was hard done by after being forced off of the track by the McLaren rookie. In the end, after a titanic battle, it was Sebastian Vettel who claimed 5th ahead of Kevin Magnussen. The Dane wouldn’t keep his position however as he was given a 20 second time penalty for forcing Alonso off track and subsequently fell out of the points into 12th. Team-mate Jenson Button would inherit the position instead, with aggrieved Alonso in 7th. After a difficult qualifying, both Force India cars managed to fight their way into the points, with Sergio Perez getting 8th and Hulkenberg getting 10th. Daniil Kvyat was sandwiched between them in 9th for Toro Rosso. Jean-Eric Vergne finished just outside of the point as the quest for a new drive in 2015 continues now that it’s been confirmed that he will be replaced by Max Verstappen. Penalised Magnussen followed in 12th, with Felipe Massa a distant 13th in the Williams. The two Saubers were the last cars on the lead lap, with Chilton and Ericsson finished 1 lap down. Jules Bianchi is the last classified finisher after retiring with 5 laps to go. Lewis Hamilton is the first listed retirement after the team decided to call it a day with 6 to go. Although it wouldn’t be the end of the drama in Belgium for the British driver. Both Lotus drivers retired along with the unfortunate Andre Lotterer who retired on the first lap of his F1 debut. Hamilton later went on to say that he was “gobsmacked” by Rosberg’s admission. The Mercedes team would go on to say that Hamilton’s quotes were an ‘accurate representation’ of what was said in their meeting. Hamilton had revealed on the Thursday before the Grand Prix that Rosberg was still holding resentment over the Hungarian Grand Prix, where Hamilton had been asked to let Rosberg by but had refused to do so. We have a 2 week wait now before the drivers are in action again for the Italian Grand Prix at Monza.